Hot on the tail of the launch of the Efergy homeCO2meter and the Wattson Energy Meter, the Owl Wireless Electricity Monitor offers home owners another way to track their electricity usage and reduce their carbon emissions. Despite being a very high quality product, the original home electricity monitor Electrisave wireless electricity monitor was recently overshadowed by the increased functionality of Efergy – a device which also benefited from a recommended retail price of just £44.99 compared to £79.99 for Electrisave. NEW The Owl now on sale is the updated Owl CM119. Click here for full details of the OWL CM119. The newly-branded Owl wireless electricity monitor offers the best of both worlds – the build quality of Electrisave for around the same price as an Efergy electricity monitor. 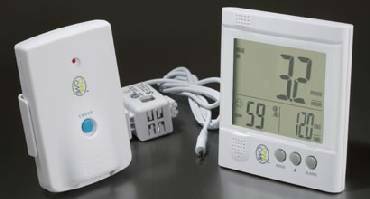 The original wireless home electricity monitor was the award-winning cent-a-meter developed and manufactured by Wireless Monitors Australia Pty Ltd and sold in the UK as Electrisave. The company (and its product) was recently purchased by 2 Save Energy PLC but without the rights to the Electrisave brand name. Therefore, Owl is simply a rebranded Electrisave at a new much improved price. 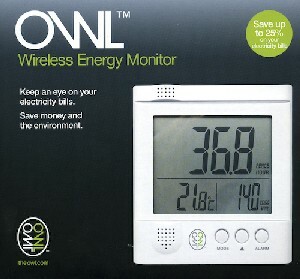 The functionality of Owl is identical to that of Electrisave. We recommend you read our article on Electrisave if you would like to find out more about the operation of Owl. Our Electrisave Review is also likely to be of interest. Click here to visit the official Owl website, or here to view the 22 page Owl User Manual (PDF). The latest version of Owl is available from a wide range of online outlets. It is best priced at The Ethical Superstore. Click here to purchase Owl, usually for around £30. A smaller less feature rich version of Owl is also now available: OWL Micro.